For millions of Americans, recycling means setting a bin full of empty steel soup cans, glass mayonnaise jars, plastic ketchup bottles and old newspapers at the curbside. It’s hard to imagine automobiles being collected for recycling, but cars are actually recycled more than newspapers, beverage cans or any other recyclable product. wire. These new sources of steel scrap are often a byproduct of the automobile while it is still in service, as well as a byproduct of the dismantling process once the car has reached the end of its road service. Steel has long been the driving force behind the recycling of automobiles, and as more infrastructure develops for recycling used oil filters and tire wire, even greater options of the automobile will be on the road to becoming new steel products. The recycling of the automobile and its components provides a steady stream of high-quality steel scrap needed to make new steel. With the nearly 13 million automobiles collected and processed for recycling last year, along with the additional scrap achieved through recycling last year, along with the additional scrap achieved through recycling used oil filters and steel tire wire, it’s fortunate that steel mill furnaces have healthy appetites for steel scrap. The whole process is an excellent example of how economics can drive recycling. In 1997, more than 13 million tons of steel scrap from automotive shredding operations were shipped to steel mills for recycling. And through the development of new recycling markets, this stream of steel scrap will find a welcome addition to the scrap used to make new steel. wire is also an environmentally-responsible means of collecting a high quality source of steel scrap and conserving landfill space. The average passenger tire contains approximately 10 percent steel wire by weight, which helps make the tire stronger and more rigid. By chipping tires and recovering the steel wire, up to 99 percent of the average passenger car tire can now be captured for recycling. These recycling innovations both conserve natural resources and conserve landfill space. When left intact, ten tires can occupy more than a cubic yard of space in a landfill, but now these tires are being put to use, along with other sources of steel scrap, to become new steel. In a single year, the steel tire wire from an equivalent of nearly eight million tires is shipped to be recycled. Oil filters are made almost entirely of steel. Despite their small size, these filters can add up. By recycling all the oil filters sold annually in the U.S., enough steel would be recovered to build 16 new stadiums the size of Atlanta’s Turner Field. Some states have banned used oil filters from the landfill, while others have placed restrictions on how they can be discarded. The U.S. Environmental Protection Agency requires used oil filters to be drained of all free-flowing oil before they are discarded or recycled. Most states follow federal requirements for used oil filter disposal. The steel industry, together with the scrap processing industry, is responsible for laying the groundwork for the efficient automobile recycling infrastructure that exists today. In an effort to provide more steel scrap to the growing steel industry and to reduce the automobile’s impact on the environment, the two industries worked collectively in the early 1960’s to develop the first automobile shredders. Today, a network of dismantlers and shredders effectively process the millions of vehicles taken off the road each year. One of the first steps in preparing an automobile for recycling is to remove all the reusable parts. This process is often referred to as dismantling. The dismantling process removes items such as transmissions, water pumps, head and tail lights and other parts which can be used to repair other cars. Once these parts have been removed, the remaining auto body is ready to begin its own recycling journey. Its fist stop is at the car crusher, where once elegant, flashy hot rods are reduced to flattened masses of steel. The auto bodies are flattened for ease of storage and processing. The flattened hulks are then sent to the auto shredder. Inside the shredder, a large roller spins a series of hammers smashing the car into bits of steel and other materials in less than a minute. Shredding the automobile separates the variety of materials used in automobile manufacturing. The shredder is found at the scrap processing facility. There are more than 200 automobile shredders in operation across North America. As the fist-sized chunks of material leave the shredder, the steel is automatically separated from the other materials by a magnet. 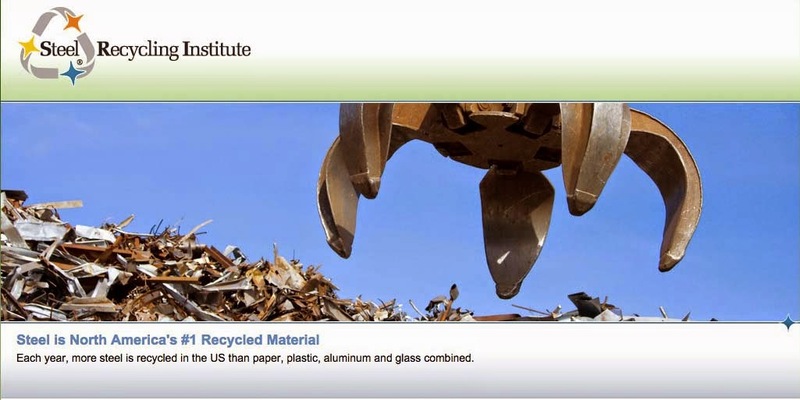 Steel’s magnetic attraction makes it easy to identify and recycle. Once the steel has been separated from remaining materials, it is then ready to make a hot stop at the steel mill to be made into new steel products. Steel scrap is the single largest ingredient needed to make new steel. Today, the steel industry’s scrap hungry furnaces recycle more than 65 percent of the steel produced each year. Increases in technology continue to push the steel industry’s capacity to recycle steel to even greater levels. This remarkable recycling achievement is by no means limited to the last few years. With the exception of the very earliest methods of steelmaking, steel scrap has always played an important role in the steelmaking process. The steel industry’s steady, increasing demand for scrap has notable consequences. First, the United States has developed the most efficient steel recycling infrastructure in the world. More than 1,500 ferrous scrap processors prepare both pre- and post-consumer steel scrap for recycling. The United States is also the world’s largest exporter of steel scrap. Like any other raw material, steel scrap has true economic value. As a result, it is collected and prepared for recycling for its market value as well as for the energy savings and natural resource conservation it provides to the steel industry. Realizing the importance of recycling automobiles, car manufacturers are designing their vehicles with a long-term view of how the components can be refurbished, reused or recycled. And when these automobiles are made from steel, the car is both made with recycled content and is recyclable at the end of its use. As a result, automakers have been using recycled material to make new cars for decades. How much recycled material? Nearly three-quarters of an automobile is made of steel and iron, and all of these steel car parts contain a minimum of 25 percent recycled steel. However, many internal steel and iron parts such as engine blocks are made using an even higher percentage of recycled steel. Overall, the average recycled content of the steel in a passenger car is approximately 44 percent. The steel industry has also made great strides in the production of steel to minimize environmental impact, and has designed new lighter, stronger steels to increase automobile safety and fuel economy. The steel industry is working to ensure that steel remains the material of choice fro automobiles. This is a challenge being addressed by the progressive steel industry. In today’s marketplace, government standards dictate that cars must be lighter and more fuel efficient but retain performance standards. The government is seeking to increase an automobile’s fuel efficiency. However, it’s important not to look at fuel efficiency “in a vacuum” and ignore that other environmental benefits that may be lost by increasing it. For instance, increasing fuel efficiency by building cars largely out of lighter weight, less-recyclable materials lowers a car’s safety and recyclability. Instead, it’s important to examine fuel efficiency with a car’s entire lifecycle in mind, including its affordability, safety, recyclability and insurability. The steel industry has responded to these demands by producing lighter, stronger steels. The latest steel alloys used in automobile manufacturing did not exist as little as five years ago. And a current steel industry project, the UltraLight Steel AutoBody (ULSAB), will shed as much as 36 percent of the weight of the frame of the vehicle with no loss of strength or performance. the world provide their customers with safer, cost-competitive, more environmentally responsible vehicles that meet increasing expectations for performance. While reducing weight was a major goal of this project, the ULSAB also met targets for structural efficiency-achieving a high-strength body with minimal mass. State of the art steelmaking technology makes it possible to shave away the weight while maintaining safety. This reduction helps both the steel industry and the auto industry improve the environment, including reductions in air and water emissions-minimizing environmental impact. With virtually 100 percent of out-of-service automobiles collection for recycling, they are the most recycled commodities in the United States’ biggest recycling success story. Automobiles contained recycled steel long before the term “recycled content” ever came into popular use.